Thinking About Cloth Diapers started out one year ago with a vision of a simple website packed with cloth diaper information. I know we've got lots of room to improve yet, but as I look back to where we started, I am amazed at where we are today! 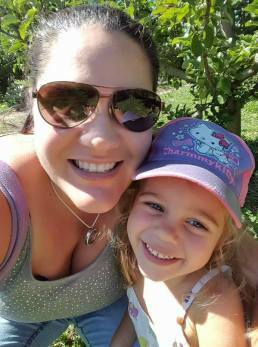 We've given away $350 to cloth diaper charities with our first ever Choose Your Charity Contest, plus we've now got more than 100 articles in place. It doesn't stop there - we've got big plans for 2013, with more new articles in the works, and more contests, guest blogs, and other events planned. As we kick off the new year, I'd like to thank each one of you for trusting us to provide you information about cloth diapers, your readership of my website, and your support through Facebook and Twitter. In a perfect end to 2012, we reached the 3000 Fan Milestone on Facebook just before New Year's Eve! And so, as we kick of 2013, I'd like to offer a giveaway and a contest! It's a small expression of my thanks for everything in 2012, and my wish to you for all the joys, love, and hope that a new year can bring! 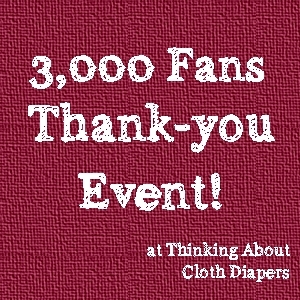 There are 2 events going on to help us celebrate 3000 Fans! For each fully completed review we receive you will receive an entry into our contest. 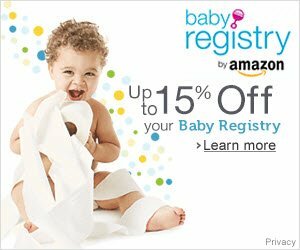 Readers are welcome to submit more than 1 review, but please only one per diaper brand/style! Before we publish any reviews, we reserve the right to edit for readability. As always, our official contest rules are also applicable. If you are so inclined, you can read the Provide a review now! We will be using the information you submit to help us decide which brands to test, work with, and give away in the coming year, and will also use it to create more content on our website! To say thank-you to each of you, I'd also like to offer a giveaway! We've worked with a lot of great brands this year, so it's been tough to decide what to give away! I'd go broke if I gave away one diaper from every brand that I love or have worked with, so I'm giving away three awesome diapers, one for every thousand fans! In the end, I've decided to support three Canadian brands that have supported me on two or more events in 2012! Of course, there will be lots more giveaways in 2013 - and lots more brands to come! As this giveaway is to thank our Facebook fans, you must like our Facebook page to enter. Additional entries are also available. Please use the Rafflecopter form below. Please note, all prizes are sponsored by Thinking About Cloth Diapers. Thank-you again for your support!